and skip the lines. For more information on seasonal events, festivals, and attractions, contact the Atlanta Convention & Visitors Bureau (800/ATLANTA). For places to stay in the area, see Atlanta Hotels. This is a literary town. You can take your teens to visit the home of “Gone With the Wind” author Margaret Mitchell, but families with younger children will find more enjoyment at The Wren’s Nest. It’s the Victorian-era home of Joel Chandler Harris, best known for his folksy Uncle Remus tales. There are story time sessions, guided tours, community workshops and a museum shop with “Br’er Rabbit” memorabilia. For younger kids, this is a terrific playspace primarily designed for ages 2- to 8-years-old. There are a lot of things to touch and feel, and comfortable areas for parents (who aren’t participating) to sit back watch. The Fernback Museum of Natural History features the world’s largest dinosaurs in innovatively designed exhibits. The 315-seat IMAX theater is a great place to cool off during the steamy summers and the new Nature Quest area offers hands-on activities, displays and live-animal viewings through which kids can explore and enjoy fun learning adventures. On weekends and during school holidays there is extensive children’s programming, as well as hands-on adventures that require advance registration. 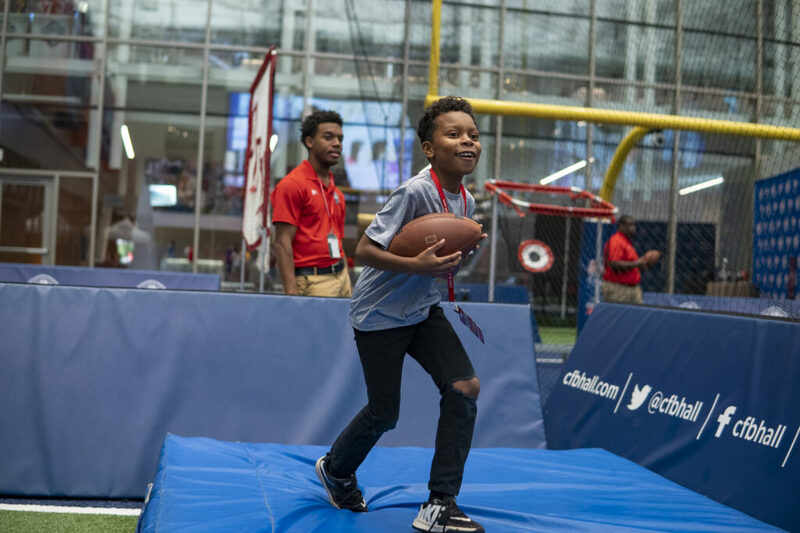 Skill catching zone at Atlanta’s interactive College Football Hall of Fame. Photo c. College Football Hall of Fame. For older children, one of the tours of the world’s most famous news source is a real eye-opener. Guides will explain how a news broadcast is put together and how studio productions work during 45-minute tours, given several times daily. Other tour options include the “Inside CNN VIP Tour” and the “Morning Express Tour with Robin Meade.” Check the site for these tour schedules and all prices. A tip: instead of waiting in line, make reservations beforehand. Children of all ages can appreciate the Atlanta Botanical Garden, which offers a Children’s Garden and a place to play, as well as kid’s programs and special itineraries. The extensive grounds are wonderful for letting off steam after a day of sightseeing. Kids can dig for fossils at the Dinosaur Garden and if everyone’s on board, you can also visit the garden’s Gainesville campus. Closed Monday. Relocating from South Bend, Indiana, the College Football Hall of Fame showcases a 94,256 square foot building near the Coca-Cola Museum and Georgia Aquarium situated in a 94,256-square foot facility in the Centennial Olympic Park area. The building houses college football artifacts, multimedia exhibits, history and trivia for football buffs. The world’s largest collection of Coca-Cola memorabilia resides at the enormous World of Coca-Cola showcase. With materials dating back ot 1886, many items on display are much different than what parents may recall from their youth. Families will be treated to various displays and activities including: Bottleworks, a comprehensive tour of a bottling plant; a thrilling 4-D theater; the Pop Culture Gallery featuring works from Andy Warhol and other great artists; an immersive experience entitled the Vault of the Secret Formula, as well as a tasting experience of a lifetime in which you will have the opportunity to sample over 100 different assortments of Coca-Cola products. Don’t forget to hug the Coke Bear mascot before you go. Perhaps the city’s best known tourist stop, at least for families, is the Six Flags Over Georgia amusement park filled with a variety of big coasters and offering thrill rides, family rides and kid’s rides, as well as fun shows and entertainment. There are lots of dining spots and shopping opportunities. The park is open weekends from April to November, and daily from about Memorial Day to late August. 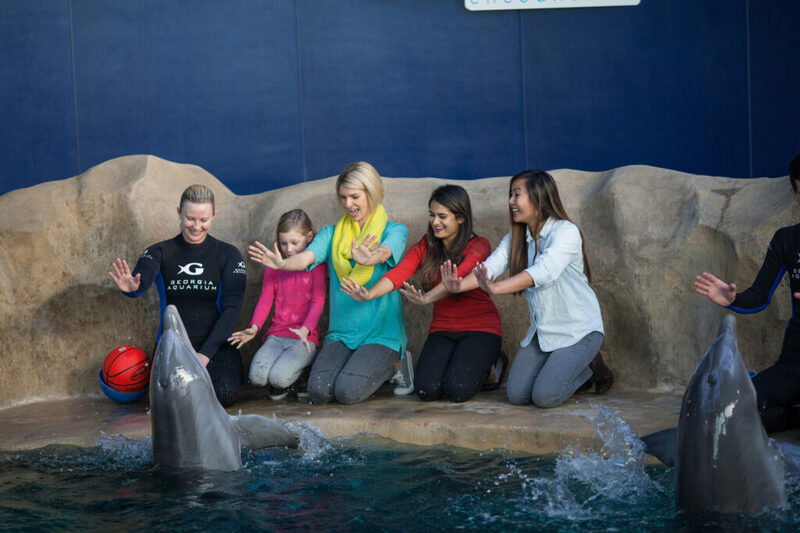 Dolphins are only one type of animal encounter at the sophisticated Georgia Aquarium, photo c. Georgia Aquarium. This stunning, multimedia collection uses America’s Civil Rights Movement as a way to examine human rights issues around the world. Among the moving and engaging experiences is a replica of the lunch counter from Woolworths where visitors can sit and be exposed to racial slurs endured by African Americans. Collections from Morehouse College and the Martin Luther King, Jr. estate are featured in the 42,000-square-foot facility and invite all ages to explore human rights in their communities. Kids under 6 free. Popular activities at Georgia’s most visited attraction include 3,200 acres of swimming, fishing, tennis, golf and other activities. A long-time family favorite, annual events include the Yellow Daisy Festival, the Indian Festival and Pow Wow, and Stone Mountain Christmas. Visitors can hike up a 1.2-mile-trail to the top of the largest exposed mass of granite in the world, and take in unparalleled views of the city. There’s also a five-mile paved path around the base of the mountain, and a scenic railroad trip. After dark, there’s a laser show and a big screen video system. This is the world’s largest collection of fish, where more than 100,000 animals representing 500 species inhabit 8 million gallons of fresh and marine water. In addition to exhibits for all ages, they offer a “Growing Guppies” talk three days a week that lasts approximately 45 minutes and is designed to introduce the undersea world to children ages 2 to 5. The Georgia Aquarium is so popular, however, that entrance lines often snake around the block; try to order advance tickets online to smooth the way. There are weekly programs and a week-long summer camp for ages 4-14 from June to September for those traveling with aspiring oceanographers. Sail above Atlanta in one of 42 climate-controlled gondolas above Centennial Park for panaraomic views of the city. Rides last up to 15-minutes and even infants are welcome. Although the ride is generally always running except Christmas and Thanksgiving Day, call or check the website to ensure the ride is running before heading out. Kids 2 and under fly free. 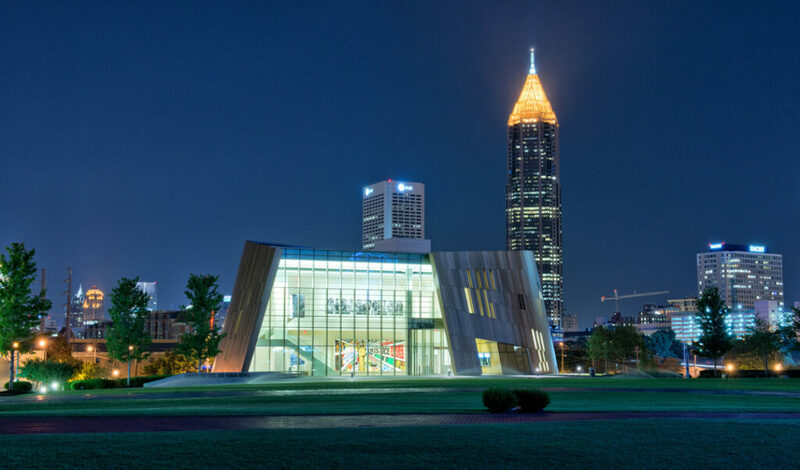 Art-lovers will be glad to know that the High Museum, and its sister institutions: the Alliance Theatre, Atlanta Symphony Orchestra, Woodruff Center for the Arts, and Young Audiences comprise the city’s heart of culture, and are conveniently clustered together. Be sure to research coming temporary exhibits, too, as the High Museum of Art partners with many American and international museums to bring to the city some remarkable works of art. If your family is looking to experience Atlanta from a local’s point of view, visit Georgia Family magazine to learn about family-friendly events and other activities you can do during your stay. The free, monthly magazine is distributed throughout the state, so you can pick up a hard copy as you explore the city for other ideas.